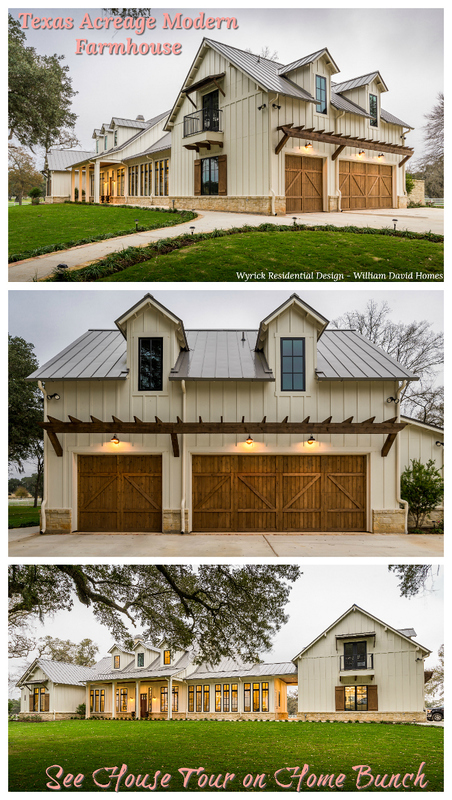 Built by Winsome Construction, this is the kind of home that makes you want to leave the city and move to the country. 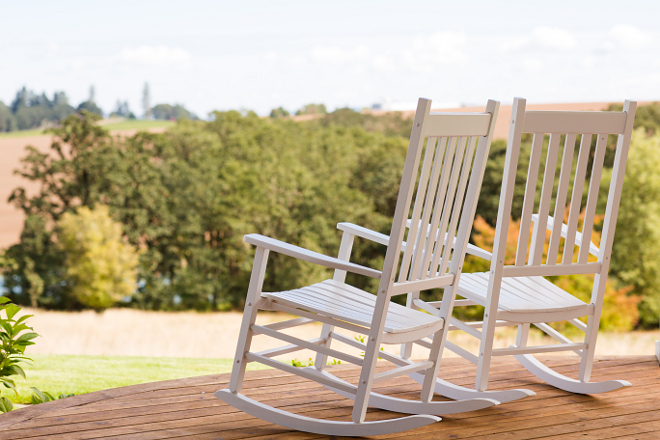 Full of charm from top to bottom, this farmhouse with a front porch is the perfect blend of comfort, warmth and beauty. 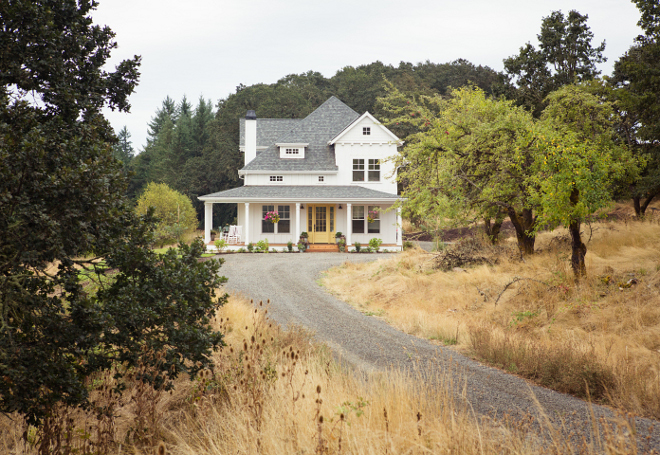 Located in the Willamette Valley countryside, the covered wrap-around porch serves as an open invitation for outdoor connection and relaxation. 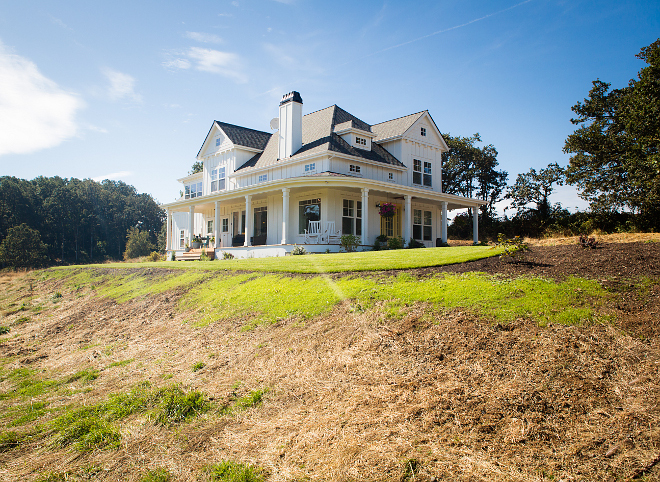 This lovely farmhouse features 2,400 square feet and was completed two years ago. Pin your favorite pictures and dream along! 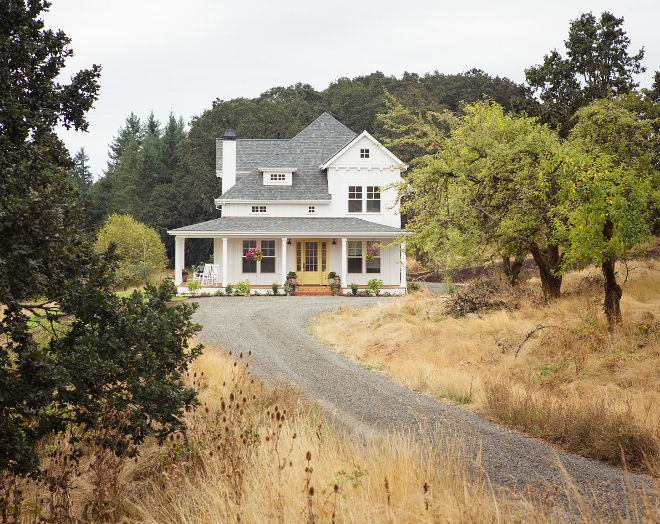 This beautiful farmhouse features 2,400 sq ft and a 624 sq ft garage. 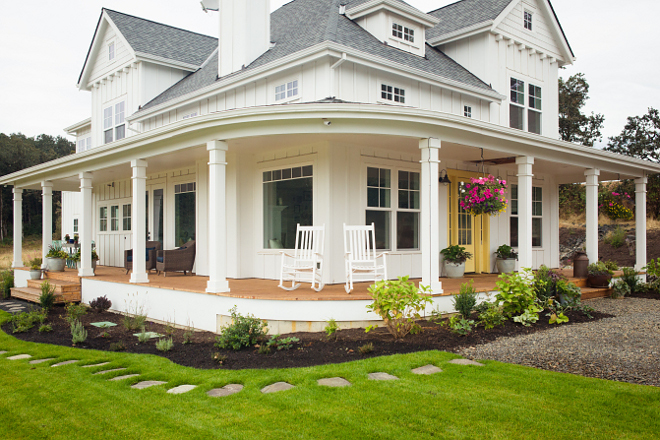 The covered wrap-around porch adds a traditional and welcoming feel to this home. I can’t tell you how much I love this. 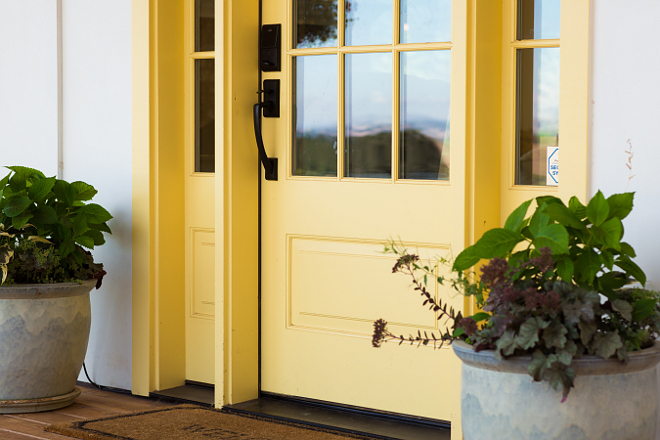 Yellow Front Door Paint Color: Sherwin Williams SW2865 Classical Yellow – (semi gloss). Sconces: Kichler – Similar: Here & Here. 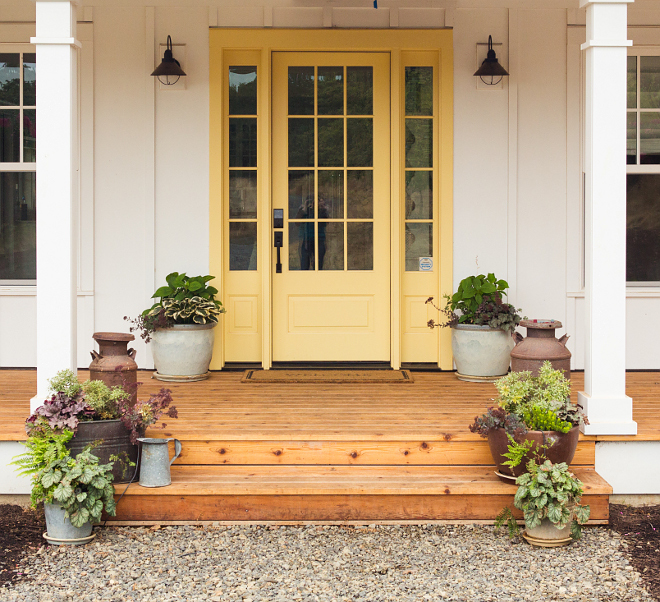 A pair of beautiful planters make this front entry feel extra welcoming. 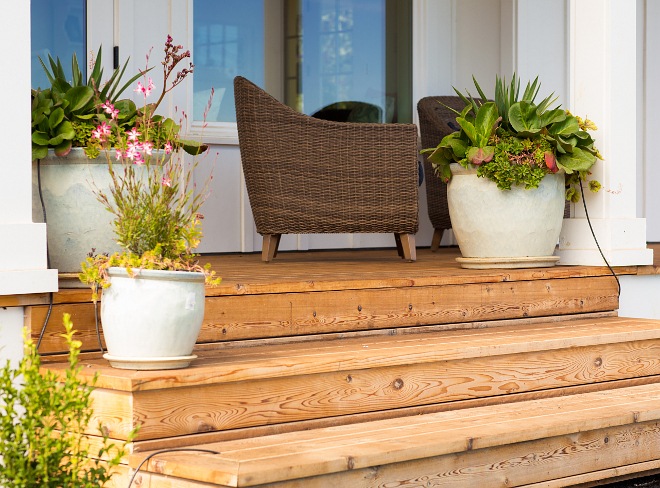 Similar Planters: Here, Here (set) &Here. Similar Entry Door Sets: Here, Here, Here, Here & Here. Beautiful Doormats: Here, Here, Here & Here. As we see here, the interiors are simple and they feel just like “home”. 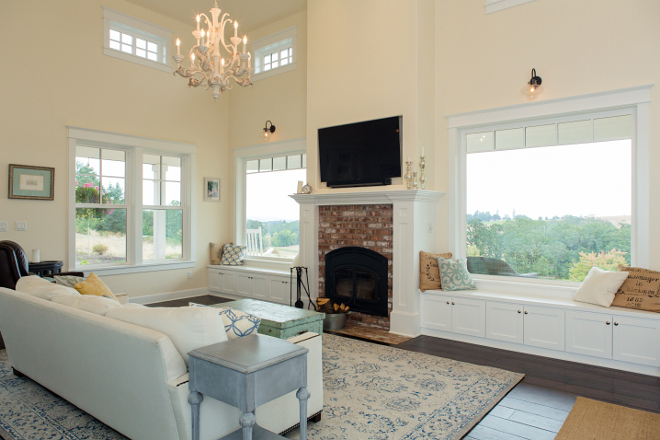 The great room features vaulted ceiling and a beautiful brick fireplace (wood burning, Biltmore 44″, with black door). 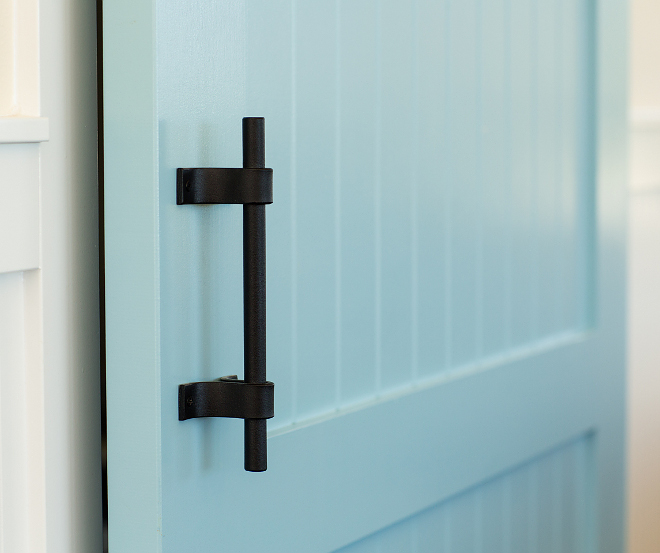 Trim: Door Style, Window wrap & base: Standard smooth Fingerjointed Pine. 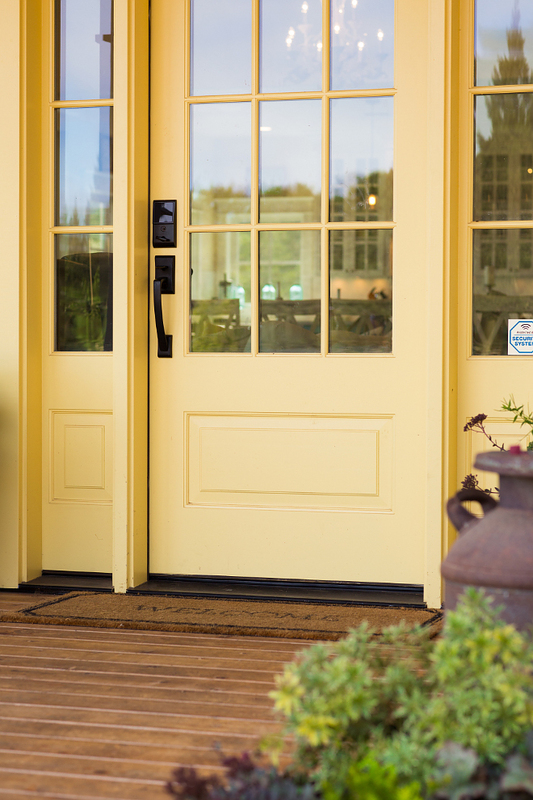 Paint color is Crisp Linen by Sherwin Williams. 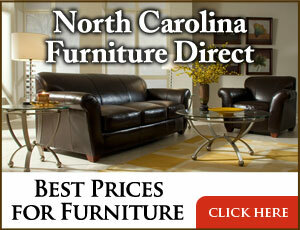 Hardwood flooring is stained, hand scraped maple hardwood floors – similar here & here. 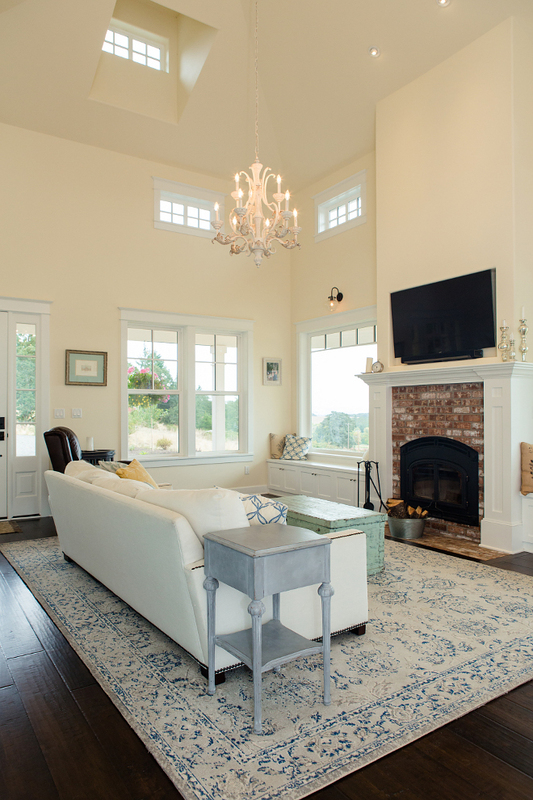 Similar Blue & Ivory Rug: Here & Here. 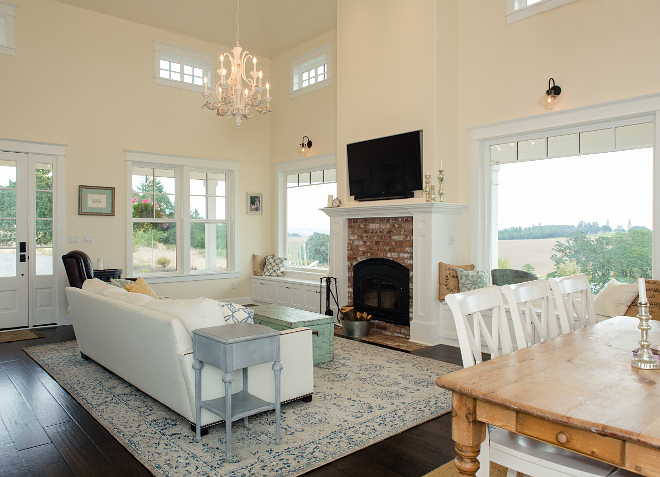 Affordable Ivory Chandeliers: Here, Here, Here, Here, Here, Here, Here & Here. Long window-seats flank the brick fireplace. Notice the beautiful country views. All trim, interior doors, closet doors and shelves, fireplace mantle, window-seats, floorboards, crown molding, beadboard are painted in Sherwin Williams Extra White SW7006 (semi-gloss). This entire space feels open and connected to each other. Rest Assured SW9061 Sherwin Williams. Open floor plan, conveniently joining the dining and kitchen areas. Farmhouse Dining Table: Joss & Main. 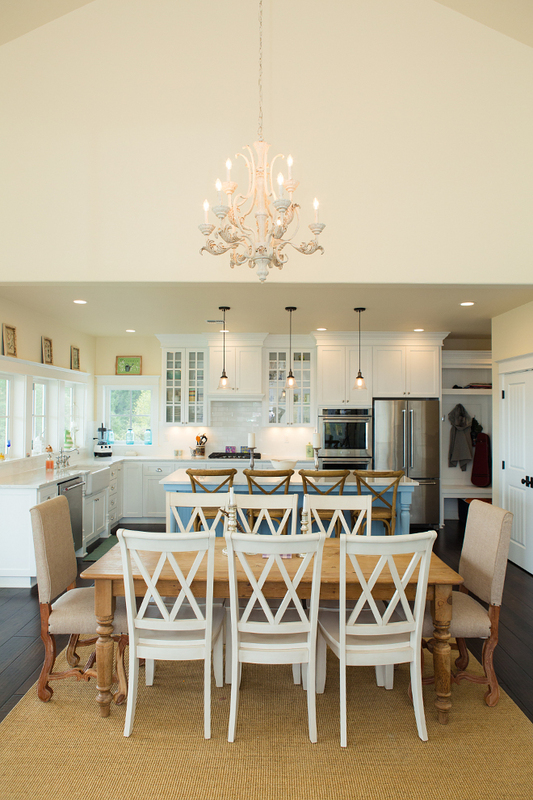 Similar Host Dining Chairs: Here & Here. This kitchen is so dreamy! It features a great layout (notice the appliances layout as well) and a beautiful color scheme. Perimeter cabinets are painted in Sherwin Williams Extra White SW7006. 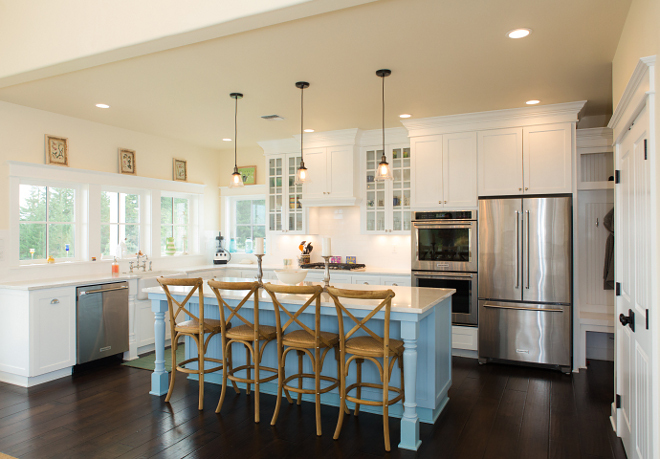 Kitchen Island Dimension: Total island is 3’6” (18” Flush bar + 2’ Island). Countertop and slab backsplash is Quartz; LG Viatera Minuet. Kitchen Faucet: Moen – Similar: Here, Here & Here. The counterstools can be found here. 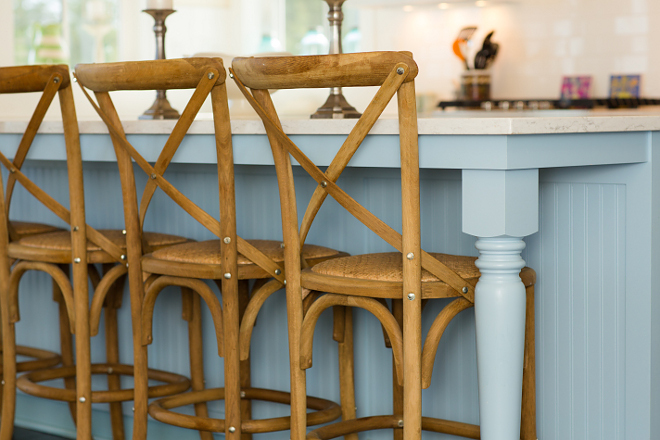 Blue Kitchen Island Paint Color: Sherwin Williams SW9061 Rest Assured. Cabinet Style:Cabinets are Wood / Melamine, Paint grade, shaker style cabinets, MDF Boxes Dovetail drawers. 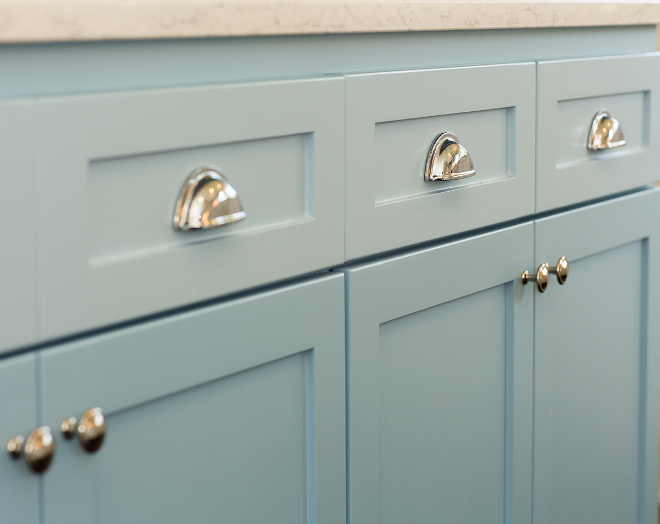 Cabinet Hardware: Pulls & Knobs (Polished Chrome). Paint Color is Sherwin Williams Stardew SW9138. 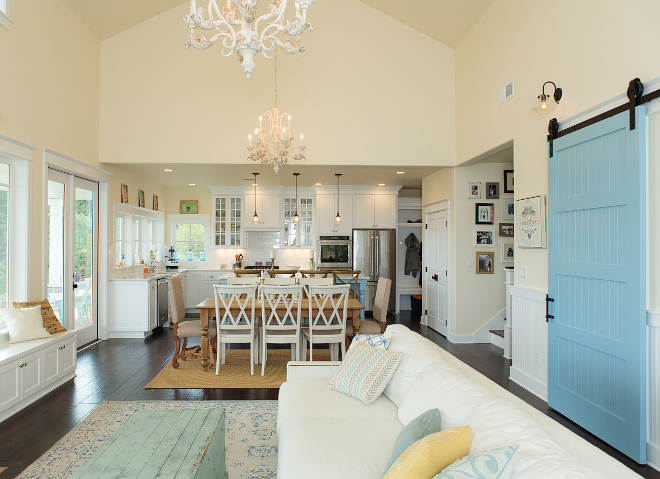 Beadboard Paint Color: Extra White SW7006. Similar Bed: Here, Here , Here & Here. Similar Bench: Here & Here. Artwork: Joss & Main – Similar here. 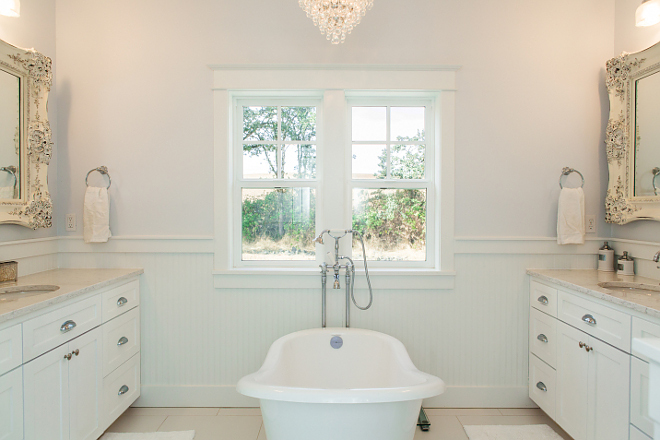 The master bathroom features vaulted ceiling, walk-in shower and a Victorian soaker tub. 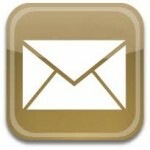 Sinks & Faucets: Oval bathroom sinks with Moen faucets. Lighting: Crystorama – similar here. Porch Ceiling and Columns Paint Color: Extra White SW7006 by Sherwin Williams. 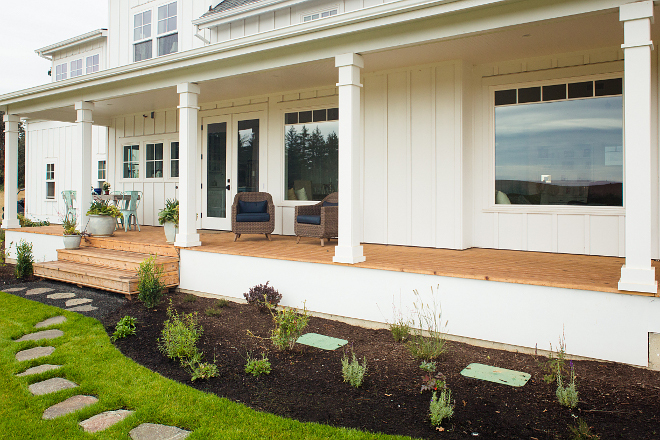 The wrap-around porch features Cedar deck boards. 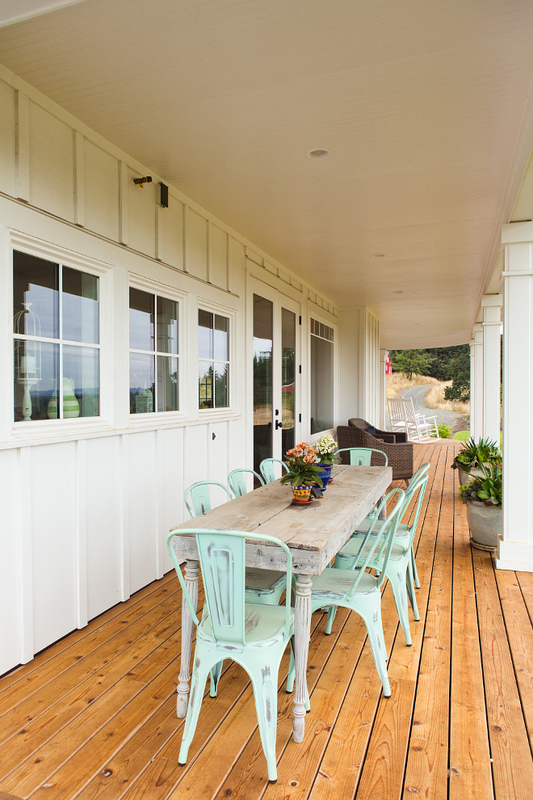 This large, wrap-around porch allows you to enjoy an outdoor meal or watch a sunset with a glass of wine. 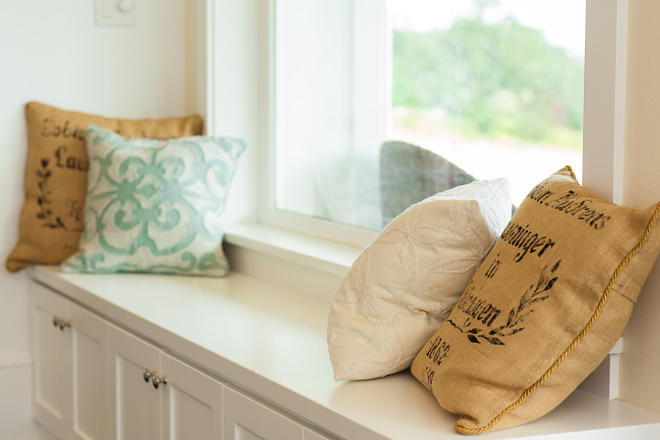 The rustic reclaimed farmhouse table is a DIY custom – which can be very affordable do it. Similar dining chairs can be found here (blue), here (aqua) & here (mint). Similar Dining Table: Here, Here, Here & Here. Keep in mind these dining tables are not to be used outdoors. You might want to treat the wood before putting outside (covered area). The exterior paint color is Extra White by Sherwin Williams. 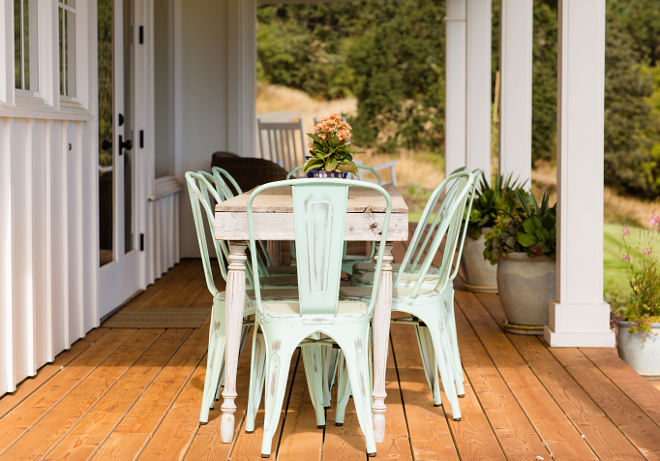 The covered wrap-around porch serves as an open invitation for outdoor connection and relaxation. 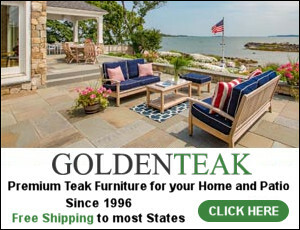 Pottery Barn: Summer Kick Off Sale: Up to 70% Off! 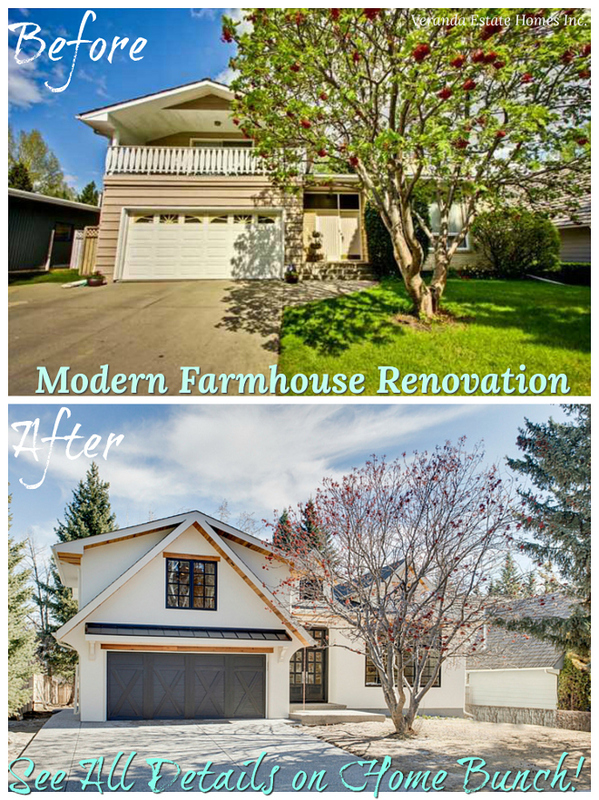 Interior Design Ideas: House Renovation. Florida Family Home Interior Design Ideas. Beautiful Homes of Instagram: Santa Barbara.